There was no margin for error for the visiting Wood River High boys' soccer team Thursday in its quest to upset three-time defending Great Basin Conference champ Jerome on in the league title game. Second-year Hailey coach Luis Monjaras figured his team had to win every aspect of the game against a Jerome Tigers squad that had enjoyed much success with a 52-5-7 regular-season mark over four seasons. Top-seeded Jerome entered Thursday's game unbeaten in 15 games since a 4-1 loss to Wood River in Hailey Aug. 31. That streak included an amazing 4-3 comeback win over #4-seeded Burley Oct. 9 after the Bobcats had taken a 3-0 lead in a tournament game Oct. 9. So, what did Wood River do? The Wolverines won every aspect of the game and got two timely goals by senior Charlie Evans to stun Jerome 2-1 and earn Hailey's first district tournament championship since 2003—and its first-ever district title at the 4A level. With its ninth win, Wood River qualified for the State 4A tournament Oct. 21-23 at Lake City and Post Falls high schools in northern Idaho. 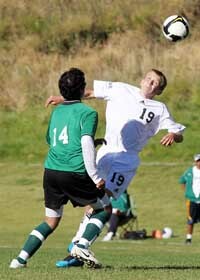 And Jerome (14-3-3) won't be returning to state at all, since Burley ousted the Tigers 1-0 in Saturday's state play-in. All because of an outstanding effort by the Wolverines. Monjaras said, "Corner kicks, free kicks and shots (8-5), we had the advantage on all of them. Our three defenders in the back got everything in the air, and Harlan (Collins) and Alex (MacMillan) covered everything in the midfield. By the end of the game both players were cramping up, they did so much out there." Wood River had shut down Jerome's chief scoring threat Sergio Madrigal in the 4-1 home triumph Aug. 31 in large part because of MacMillan's man-marking on Madrigal. This time, on the road, Monjaras decided the Wolverines had to think more about putting the ball in the net. Monjaras said, "This time we decided not to have one person mark Sergio. We needed more of the attacking part of the game. "If Jerome got the ball and started back down the field, Alex or Harlan had to find Sergio right away and pick him up. He got away a couple of times, but our defenders shut it down right away. Spyder (Turco) was really, really solid in the back. Trailing 1-0 early, Wood River equalized in the 19th minute on a perfectly timed Evans header off a long throw-in by senior Collins. The Wolverines appeared to grab a 2-1 lead before halftime on a Bryan Donoso and Ian Murphy breakaway that Donoso finished, but the officials disallowed the goal because a Tiger defender had fallen down on the field. "No whistle was blown and the official let the play continue," said Monjaras, in disbelief. About the officiating, he said, "The whole season, it's been tough. We let the refs get to us when we lost at Jerome during the season. I just told the team, if there is a bad play, let me take care of it instead of you saying something." Evans completed a Hailey attack early in the second half for his team-leading eighth goal and a 2-1 lead. Monjaras said, "We played it from the back to the midfield and out on the wing, where Alejandro (Garcia) made a nice run on the flank. He crossed it to Donoso, who took a shot that landed near Ian. Ian passed the ball to Charlie and Charlie scored." Jerome frantically applied tons of pressure as the game's regulation time ticked away. Monjaras said, "Toward the end of the game there was a lot of pressure on us and we responded well. (Goalkeeper) Dylan Carey had a very, very solid game, one of his best. He communicated well with his defense and made a couple of nice saves—one that he deflected over the net and another from the corner where he was the first one to the ball." The coach added, "The boys were eager to play and they really wanted that district championship since they haven't had one in seven years." Wood River (9-6-1) and 6th District champ Bonneville of Idaho Falls (13-2-2) clash Thursday, Oct. 21 at 11 a.m. at Lake City in the first round of the eight-team State 4A meet. It is Wood River's 19th state appearance in 25 seasons, and the school's second straight. They'll be facing a tough Bees squad. "Last year Bonneville was a really solid team," said Monjaras. "We aren't taking any team lightly." At last year's state tournament in Caldwell, Bonneville won overtime games over Jerome and Century of Pocatello then lost the state championship game 2-1 to Sandpoint (16-2-2). But Sandpoint, winner of two straight state titles and seven overall, won't be returning this year. Wood River and Bonneville are two of only four teams returning to the State 4A tournament from last year's meet. The others are Century (13-6-2) and Middleton (14-5-2) who will clash Thursday at 2 p.m.
Other match-ups are Moscow (10-8-0) vs. Columbia (12-5-1) at 11 a.m. and Bishop Kelly of Boise (11-4-4) vs. Great Basin Conference runner-up Burley (10-3-7) at 2 p.m.
Bonneville owns a 7-4-1 advantage in the boys' soccer rivalry with Wood River that started in 1987, including 2-1 and 1-0 wins at the 1992 and 1993 state meets. But Wood River beat Bonneville in a state play-in game 3-1 the last time the two teams clashed in 2004. Monjaras, whose team lost to Hillcrest of Idaho Falls 4-1 and Jerome 3-2 while beating Skyview 3-2 last year at state, said, "Bonneville is comparable to Skyview and Jerome in they like to play the ball on the ground. Their kids are good ball handlers."